Keep your heart strong and young by giving it a good, regular workout. Your heart, like any other muscle, can weaken over time, especially if you are sedentary. As you age and become less active, the muscle in your heart's left ventricle — the chamber that pumps oxygen-rich blood back out to the body — becomes stiffer. "This change in the heart muscle, coupled with simultaneous stiffening of the body's arteries that leads to high blood pressure, begins a harmful cardiovascular aging cycle," says Dr. Aaron Baggish, director of the Cardiovascular Performance Program at Harvard-affiliated Massachusetts General Hospital. "Without intervention, this sets the stage for heart failure later in life." But as with your other muscles, it's possible to strengthen your heart and even reverse some of its aging. The solution: regular cardio exercise. "Research continues to show that exercise is the best way to slow your heart's aging process," says Dr. Baggish. This is not a surprise, as increasing exercise and physical activity are often the first prescription for improving overall heart health. So how does exercise help an aging heart? When you exercise, the exertion forces your heart to pump more blood around your body to your muscles and lungs. The entire process relaxes blood vessels over time and makes your heart run more efficiently, both of which keep your blood pressure low. The standard recommendation for fitness is 150 minutes of moderate-intensity exercise per week. But does the type of exercise matter when it comes to your heart? "Any type of aerobics is always better than nothing," says Dr. Baggish. "Your heart doesn't know the difference between a brisk walk and an elliptical trainer. The goal, then, is to do some kind of cardiovascular exercise — anything that gets your heart pumping and makes you sweat." Still, to maximize your exercise efforts for the purpose of improving an aging heart, intensity and duration matter. One study, published Jan. 8, 2018, in Circulation, found that exercise can reverse damage to sedentary aging hearts — if it's enough exercise. In this study, researchers recruited 53 people, ages 45 to 64, and split them into two groups. One group followed a set of exercise programs that varied in frequency, duration, and intensity. The other group did non-cardio activities, like yoga. recreational activities, like playing tennis, power walking, or cycling. The researchers found that people who exercised for four to five 30-minute sessions a week improved their VO2 max (the maximum amount of oxygen your body can use during exercise) by 18% compared with the control group. Those in the exercise group also showed an average 25% improvement in the elasticity of the heart's left ventricle. 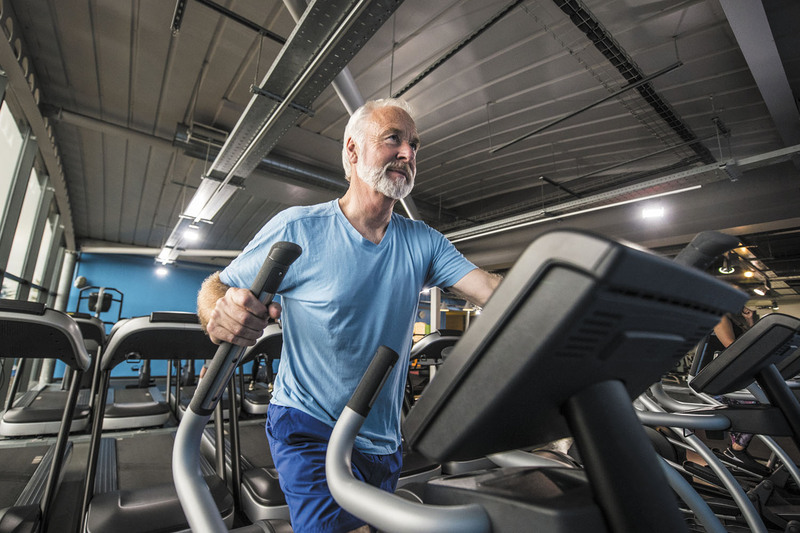 "The noted improvement in VO2 max is critical, as improved VO2 max is a well-established marker of longevity and physical capacity," says Dr. Baggish. Which is best for your heart: a Mediterranean diet or a lacto-ovo vegetarian diet? The results of a study published online Feb. 26, 2018, by Circulation found that over all, both were equally effective. The Mediterranean diet has long been the model for a heart-healthy diet, as it emphasizes high amounts of fruits and vegetables, whole grains, legumes, and nuts; moderate amounts of fish and poultry; and healthy oils like olive oil, while limiting red meat. A lacto-ovo vegetarian diet excludes all meat, but includes eggs and dairy. The researchers divided 107 overweight people with a low-to-moderate heart disease risk into two groups: one followed a low-calorie Mediterranean diet, and the other, a low-calorie lacto-ovo diet. After three months, they switched diets. The results found that on either diet, people lost about 3 pounds of body fat. The Mediterranean diet was more effective at reducing triglycerides. But the lacto-ovo diet was better at reducing LDL (bad) cholesterol levels, high levels of which have a stronger association with heart attack risk. The researchers' take-home message: both diets are helpful, since they promote proven heart-healthy foods and limit or eliminate added sugars, saturated fat, and excess sodium, all of which are linked with higher heart disease risk. Even if you have been sedentary for many years, it's not too late to help your heart, suggests a study in the February 2015 Circulation: Cardiovascular Imaging. Researchers enrolled 45 male recreational runners, average age 50, in a structured 18-week training program. The men ran between 25 and 35 miles per week. The goal was to see if moderate-intensity exercise could change heart structure and function in an aging population. Afterward, tests showed that the training program improved overall heart function among all the runners, including increasing the size of their heart's left ventricle. It also improved VO2 max by 4% and lowered blood pressure, especially among the less experienced runners. "In this case, the level of running was approximately the same exercise load as proposed by physical activity guidelines," says Dr. Baggish. "It shows that you can easily attain the level of exercise needed for powerful therapeutic benefits." So, do your aging heart a favor and get moving. Ask the doctor: Would moving to a lower altitude help my heart rate?